From the Macintosh desktop, navigate Finder > Applications > VZAccess Manager. From the Menu Bar, click Options > Network Selection. Elige la opción deseada en el campo Network Mode. 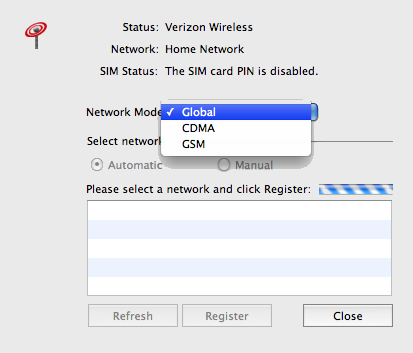 If switching to GSM Mode, select the desired option from the Select network field. If selecting Manual, ensure that the desired network is selected from the "Please select a network and click Register" field then click Register. The network with the strongest signal is used. Se usará una red seleccionada.